Sampling Utah beers that brought home the gold. In the craft-beer universe, our hallowed suds are not just an adult beverage; we consider them to be part of our cultural and social circles. It's a common drink that has become more of a luxury than a staple, yet we still seek it out—preferably in the company of other like-minded devotees, hoping to share the experience of this simple libation. When beer nerds gather in large numbers, it's truly a spectacle to behold, and there's no greater such phenomenon than Denver's Great American Beer Festival. Every fall, brewers and beer-lovers gather to celebrate our favorite drink with competition and comradery. Earlier this month, I finished my 19th year at the GABF, which welcomed some 3,900-plus beers from 800 breweries representing all 50 states. 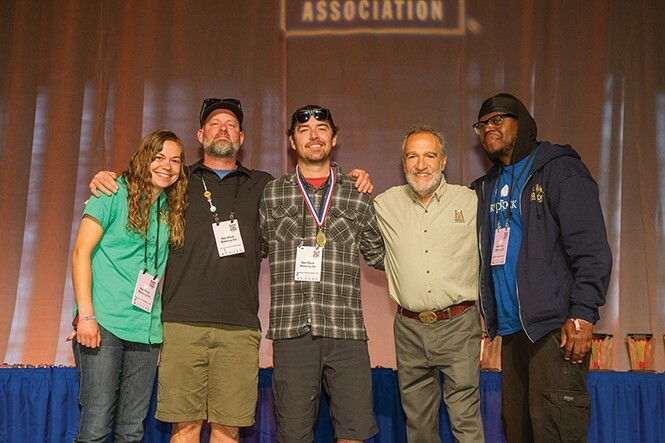 In total, 293 medals were awarded; of those, Utah managed to eke out two gold ones in this granddaddy of all-American beer competitions. Here are my impressions of these best-in-category winners. Red Rock Brewing Co.'s Zwickelbier: It pours a near hazy golden/copper color. This lager is definitely not filtered, which is wholly appropriate for the style. As I get my sniffer on top of the foam, spicy, grassy and floral notes start to pop, which gives the impression of a hop-forward beer, but instead finds a balance with subtle bread-like malt aromas. Upon first swig, I'm met with spicy European hops, as pleasant grassy, floral and lightly peppered bitterness lights up the sides of my tongue. The malt character slides in next, and is more apparent than the aroma lets on. Biscuit, bread and light crackers soften the bitterness, leaving just enough lingering dryness to tie it all together. It's deceptive in its simplicity in that more keeps coming out with each sip, making it enjoyable and balanced. It finishes brilliantly clean and beautifully dry. This 4 percent ABV beer is pretty much all I drank on my birthday. Overall: This is one that I wish I could get every day. It's an incredibly well-made lager that is, sadly, only a seasonal offering, but that season is right now at Red Rock locations, so don't miss out on the best zwickelbier in the country. Squatters' Hell's Keep Belgian Golden Ale: This ale pours a somewhat clear, golden amber color with a nice 2-3 finger pillowy white foam. The nose is a spicy pear, apple and banana salad with clove, pepper, herbs and bubble gum. In the mouth the same fruity pear, peppery clove and banana appear with the added harmony of earthy biscuit malts and lingering floral/herbal hops. The finish is drying, aided by its 7.7 percent ABV. It has a nice balance and complexity of flavors; not cloying at all. The body is medium to high with a fairly creamy and prickly mouthfeel that helps fan those bubble gum notes. The alcohol is well-hidden, with only the slightest bit of warming in the mouth as it finishes. This yeast-driven beer is a real treat, especially with the colder weather approaching. Overall: There's a great complexity and balance of flavors on display here; it's very smooth and crisp to sip on. It's available practically all year long, so there's no excuse for not trying this gold-medal offering. Both Red Rock and the Utah Brewers Cooperative have been honored with Brewery of the Year awards from the GABF, in 2007 and 2010, respectively. These awards are no fluke; get out and enjoy these beers sooner rather than later. As always, cheers!